Juicing For Weight Loss – Does it Work? Juicing for weight loss is a healthy way to loose pounds. But perhaps more importantly it a way to keep the weight off long term and kick-start a new healthier eating plan. We’ve all heard about or taken part in what I would call fad diets. They claim to help you loose weight as fast as possible. They often focus on one food or a lack of variety in what you are allowed to eat. What they also fail to tell you is once you stop the diet you just put the weight straight back on again. What I really like about juicing for weight loss is it helps you develop a diet that gives you nutritional benefits alongside the weight loss. It’s a regime that you will want to incorporate into your normal everyday eating plan after your initial diet. All of this prevents you from putting the weight straight back on again. Vegetable juicing is widely thought of as the best when juicing for weight loss. This is because vegetables on the whole contain less sugar than fruit juices and there are certain vegetables that are natural appetite suppressants. By combining the right combinations of vegetable juices you are still able to create juices that are sweet to the taste contain few calories and with no added sugar. By drinking these juices it will curb your desire to reach for the biscuits or chocolate. 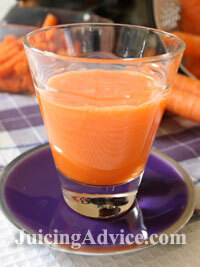 Click here for some of my favourite juicing recipes for weight loss. By following a juicing diet you will be amazed by the added health benefits. Freshly juiced fruit and vegetables contain a wealth of vitamins and minerals. By juicing a variety of types of fruit and vegetables you will be giving your body all the nutrients it needs to function properly. Faddy diets that concentrate on literally one type of food just can’t offer you the variety of nutrients your body needs to function properly. Weight loss shouldn’t mean loosing the ability to function just because you’re on a diet. Juicing will also give you the scope to invent or choose recipes that suit your particular palette. A juicing weight loss diet doesn’t have to be expensive. You have the initial cost of buying the juicer but that’s it. If you buy the right juicer then it may well stay with you for your lifetime anyway. After that you will just have the day-to-day costs of fresh fruit and vegetables. But lets face it we all know that fruit and veg cost a lot less than cakes, biscuits and prepared foods that are full of added sugar and saturated fats. They also provide you with more nutrients, vitamins and energy than those sugary snacks, that’s got to make them better value for money. By buying the right juicer you will also discover other healthier snacks that you can make with your juicer. These include fruit ice creams, sandwich fillings and fruit salad dressings. Following a juicing for weight loss plan you will not only benefit from the weight loss but you’ll discover the long-term health benefits of juicing. Once you’ve experienced these benefits believe me you’ll quickly become a juicing convert.